Driving today through Port-au-Prince in the glaring summer sun, there is still plenty of rubble being removed. Presumably, almost seven months after the earthquake , bodies are still being discovered. Horrific stories are told, especially about what happens to some vulnerable girls and women in camps. Too often you pass tent camps where thousands of people are cramped together in temporary housing that seems it will be all too permanent. So much promised aid hasn't yet arrived. There are also pockets of hope. I don't know if it's escapism or necessary psychology for keeping at something when circumstances are overwhelming, but focusing on progress and hope seems like a helpful way to take it all in. Today a couple of Haitian colleagues and I met with the director of a well-respected theological seminary in Haiti  about a potential partnership to give scholarships that would also engage students in learning through Haiti Partners work. The conversation itself, which took place outside because the seminary's office had collapsed, was a commitment to the long-term future and to what a leader can mean for a church and community. Today I saw a colleague, Coleen, who works with two other organizations, Beyond Borders and Limye Lavi. Part of their work is helping thousands of post-earthquake orphans -- hopefully to reunite them with their families, which they've been able to do for some. But they suspect the majority no longer have families they can be reunited with, so the focus becomes the best way to support them into their new lives. Today I spent time with a colleague Jean Claude Cerin, who is director of Tear Fund in Haiti. 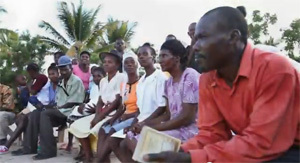 They're doing extensive disaster relief as well as staying committed to their nine Haitian partner organizations that have been working for long-term development around the country. There are many reasons for despair too. No need to pretend there aren't. It's unbearable what hundreds of thousands of people are facing just to survive. But focusing on the areas of progress seems worthy if -- and this is a significant "if" -- it is not an excuse for ignoring what is still wrong, but rather increases strength and commitment to work alongside Haitians to keep turning the reasons for despair into reasons for hope. And I guess this is generally true about choosing to focus on hope and progress. Kent Annan is co-director of Haiti Partners (www.haitipartners.org ), which has set up an Earthquake Response Fund. He is also author of the new book Following Jesus Through the Eye of the Needle: Living Fully, Loving Dangerously  , which is about living and working in Haiti.